Hi I have a hairline crack in the front of my toilet flush box it is not leaking should I replace the toilet. I would replace at least the tank ,if that is what is cracked. Chances are it will never leak but chances are it has the possibility of leaking as well. I would replace toilet as well. If its going to split, it will happen during worst of time. re: During Sunday evening when no local hardware stores are open. And, one cannot shut off its stuck valve. Ouch! 2 - Today's toilets come in different heights (from floor to seat lid) as well. I like higher seat models. But, family's with very young kids might light closer to ground seat distance better. 3 - Today's toilets also come in low water usage versions. Great if one's water bill is high. For septic systems & Well systems, I like using normal flow water volume models. 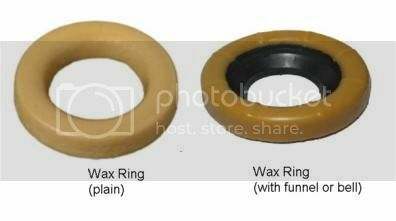 5 - While replacing toilet (with appropriate new wax ring), remember to inspect (replace if needed), its shut off valve as well. I like using braided steel flex hose - instead of solid chrome or plastic supply line hose. Dragging up an old thread. Upon reinstalling my toilet at 3AM I was inspecting (noticed fill valve was spraying out the top gasket a touch) and found a crack inside the top tank. I guess it was already weak and the stress of peeling it off the floor opened it. Now it drips. Thank you for this info, I had no clue you could buy a tank for $34 vs a new toilet for $200. That's part of my project now today. This is why I've spent hours searching/reading the help you guys give. Soaking it up like a sponge. Update...I got to the orange store and got distracted by something shiny. They had a Glacier Bay dual flush push button with better flow rate. #1 is 1.1 and #2 is 1.6. All others were 1.28 gpm. There were complaints about low quality parts and a flapper that sits high in the tank. So instead of being aggravated with low gpm, changing out to the parts I wanted in it, plus all that cleanup, I found a better deal. I'll take the old one to the campsite. It won't care.